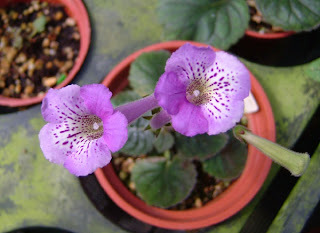 This plant was named after the amateur hybridist Vivian Liu who owns the An's sinningia series. This one should be from her first try of mini-sinningia cross. 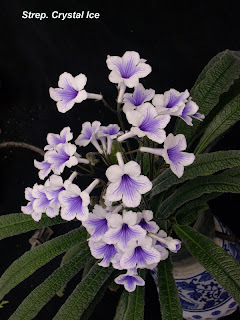 Light to medium lavender blue with heavy spots. Nice round foliage and easy to bloom. 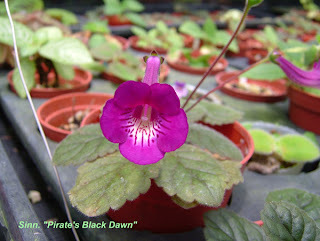 I named this hybrid "Black Dawn" due to the impression of its dark purple with white throat. 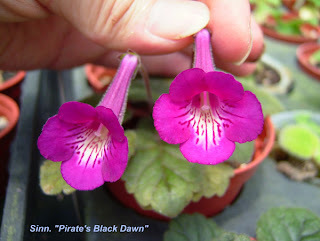 I appreciate the color is smooth like the dark velvet and the flower size is large. The foliage is compact and flat. Sinn. 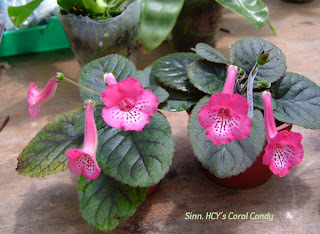 HCY's Coral Candy is a decent hybrid by famous Taiwanese hybridist Mr. H.C.Y. This plant has flat , neat and compact foliage. The coral red flower with spotted throat is fascinating. 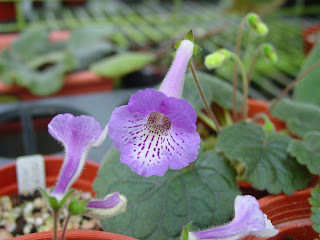 A very good mini-sinningia from HCY's sinningia hybrid family. This pretty Strep. "Crystal Ice" is in bloom now. I have grown this species for at least 2 years. With the heritage of Strep. kentaniensis , Strep. Crystal Ice has better tolerance of hot summer which makes it an easier grower in Taiwan. Pirate's Beautiful Mess is a hybrid of Sinn. "An's Sparrow Blue" with Sinn. 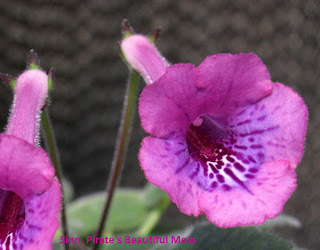 "Purple Jessup". The flower color is collided with red and blue presentation which features a contrastive character , such a beautiful mess it is. :) It is also a good bloomer. 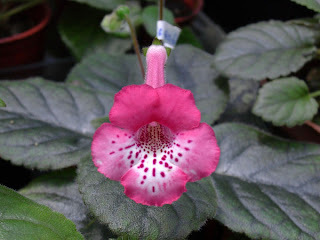 Look , the mini-sinningia is one of the best hobby plants for growers who are eager to garden but get small space. 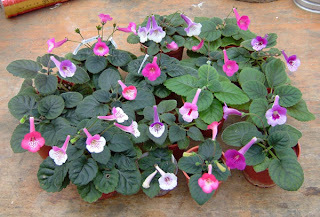 The multi-color flower , the super compact size plant and the easy-grow habit are the important reasons to love the mini-sinningia. In the summer time of Taiwan , how can you expect you get floribunda ? 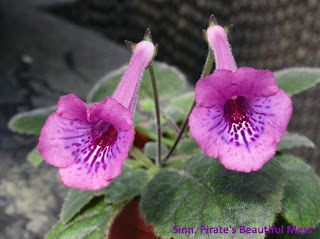 But the mini-sinningia is the correct plant that can bring you joys in hot summer.